The following workshop has been developed for parents as an informative and interactive companion to the CODE Parent Toolkit. It can be delivered by members of a school as a face to face group parent engagement strategy or as a stand alone activity for parents to work through on their own either at home or at school locations where a parent area, lounge, or lending library has been established. Ultimately, this resource has been developed to accompany and support the CODE Parent Toolkit embedded below. Each strategy presented in the guide is represented with a practical web-based counterpart / activity. Each activity lends itself perfectly to starting and maintaining those all important conversations between parent and child. The conversations created though these activities will help to provide the respect and comfort that is necessary for meaningful dialogue and reflection on both physical and virtual identities. The goal is to provide parents and guardians with tips, tricks, and strategies en route to understanding their own digital footprint and how they work with their children to understand theirs. The Rationale / Description: Our global society has changed how students find, access, and use information. Collaborating online and sharing information is a skill that needs to be nurtured. Information on the Internet is vast but it can also be overwhelming. How do you filter all of the information that is available and how do you determine what is good and what is not? Further, how much information are you providing online and how does it represent you? Explore how to use and share information on the Internet while protecting the privacy of you and your children in the process. In today’s complex physical and virtual world it is becoming increasingly necessary that children and adults alike understand their digital identity so as to ensure that it is a true representation of the real-life physical self. This workshop is designed to provide tips, tricks, and strategies for ensuring a basic understanding of the digital world and strategies for working with your tweens and teens at home. Presentation Framework: The framework of this presentation and workshop is the CODE (The Council of Ontario Directors of Education ) Parent Toolkit (specifically pages 32-37). The activities within are intended to spark conversations between parent and child so as to develop a relationship and culture of trust. The activities provide the foundation with which to ask those all important open-ended questions that start a conversation rather than one-word answers. For example, the Reppler website (http://www.reppler.com) is a social media monitoring service designed to help users manage their online image across different social networks (i.e. Facebook, Twitter, and YouTube). It does so by showing users how they are perceived across social networks, by telling users the makeup of their social network connections, and by identifying any potential issues and risks. By its very nature, the service provides a snapshot of use which is perfect for conversations between parent and child. Currently, the presentation is designed to be presented in person. Coming Soon, I plan on posting a script and user guide that can be utilized in a stand-alone / on-demand environment. Please offer comments in the space below and I will be sure to answer. I will also be posting suggestions for using this resource in a variety of learning environments. PreviousNo @dougpete, the @WordPress App is a Step Backwards! The parent tool kit and the slideshow are great tools to show parents. Teaching students about how to be responsible when using the internet is critical to safety. Unfortunately, there are online predators, cyber bullying, and scams online. Parents can play an integral role in working with their child. Especially for parents who work getting involved with the educational process at home makes yet another reason why technology is a great tool. However, step one for kids is learning how to be responsible when using the internet. Educational leaders can get involved by connecting with parents and supplying information and training like this one. Thank you so much for your comment and for your kind words. My hope is to be able to provide practical tools and activities to fit the plethora of strategies that are being provided through resources such as the Parent Engagement toolkit published by CODE. Digital citizenship, responsible use of the Internet, and digital “street smarts” definitely start at home and need to be modelled by adults so that children can see what it looks like and how to be safe and good people both physically and virtually. 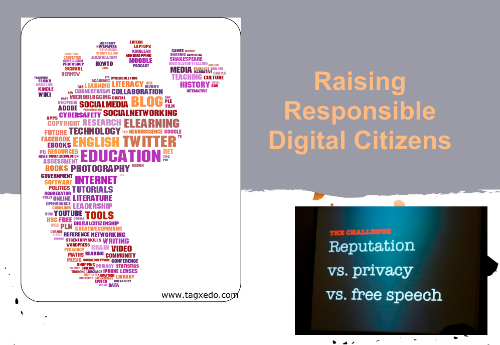 As today’s youth are part of the global digital community, it is critical to model and teach responsibility. The toolkit, slideshow, and resources provided are an invaluable package of information. The workshop presentation is an excellent venue to help facilitate and foster the conversational element of Internet usage, safety as well as our global footprints. As a middle school teacher, parents often feel their child needs their attention less due to the advantages and ease of information provided by technology. I greatly appreciate how this program brings parents back into the equation, illustrating examples and strategies that will assist them in raising a digitally responsible citizen.